Online video has become ubiquitous on just about every type of connected device imaginable, and more businesses are investing in producing video as viewers demand more live and on demand content. The process of distributing video content to an array of devices, managing a growing video library and gathering analytics on viewer behavior can be extremely complex, time consuming, and sometimes overwhelming, but it does not have to be. In this document, we will review a typical video workflow and identify potential problems at the key stages: file preparation, upload, content management, delivery, playback, analytics and monetization. 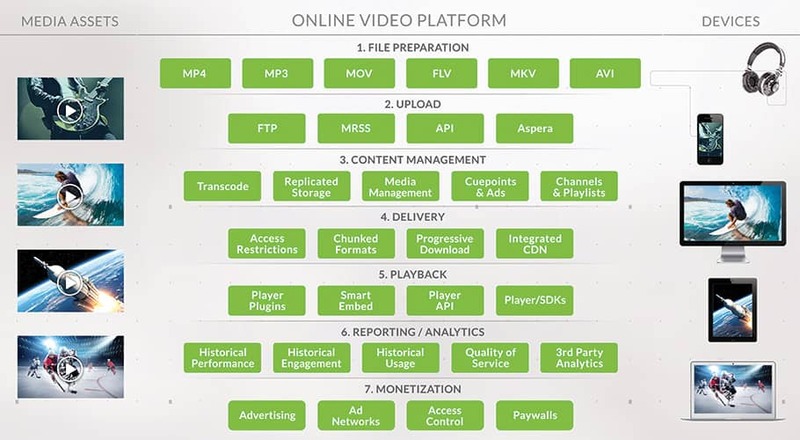 In each stage of the workflow, we will explain how the Limelight Video Platform (LVP), a complete end-to-end video management and publishing solution, will improve your video processes so you can deliver broadcast quality video to your viewers, no matter their location or the media devices they use. Optimizing the video workflow should be the goal for every company that produces videos and makes them available for its customers. Streamlining the workflow will dramatically reduce the time it takes to create videos, publish them and analyze the viewing results. The video workflow covered in this article includes seven steps, but depending on your business model, your workflow may end up being less. As illustrated in Figure 1, the workflow starts at the file preparation phase, which is explained in the next section. Before you upload videos to LVP, you will need to decide the best format to encode your master videos. Standardizing the video format now will make it easier to manage and organize them as your video library grows. To ensure optimal playback quality and efficient uploading of videos, Limelight recommends the video source files be recorded as MP4 files (H.264/ACC-LC). H.264 is a very efficient video codec and is supported by most connected devices. This video codec can be delivered over a variety of streaming protocols including HLS, MSS, and MPEG-DASH. Note: Companies should be aware that Adobe will retire the Flash video format and player in December 2020 and therefore should transition any existing Flash content to a new streaming format. Limelight provides detailed recommendations (CODECs, containers, bitrates, resolutions, etc.) for all video source files. Using these specifications when preparing your videos will ensure they play on any type of device and provide the best quality of experience for your audience. Producing videos in multiple formats and bitrates so they play on any type of device can be a challenge. Doing the transcoding manually is not efficient and can often result in videos playing poorly, or worse, not playing at all. Videos can be uploaded to LVP storage using its browser-based console, FTP, Aspera, MRSS or APIs. LVP can be easily configured to automatically transcode your video source files in the cloud to whatever streaming formats and bitrates you need to support your viewers. This ensures your videos are able to be played on any device type ranging from laptops and mobile phones to smart TVs and dedicated streaming devices. Content management is one of the most important steps in the video workflow. Managing a growing library of large VOD files is expensive and a serious challenge for companies. Adding metadata to your video assets such as subject, title, genre, description, etc., can be extremely tedious; however, LVP supports the use of REST APIs and MRSS (Media RSS or Media Really Simple Syndication) to automate this task. For example, let us say your video library will eventually include hundreds of videos that will be used for “Training.” Manually adding that metadata to each asset would be very time consuming. Using an API or MRSS, you can easily apply metadata to the video asset as it is uploaded, or you can use them to add metadata to existing media in your library. LVP tackles the challenges of managing online video by giving you complete control of your video files. If your media contains metadata, LVP allows you to filter, sort or search on that metadata so you can easily find video assets. LVP also allows you to syndicate your video content directly to sites such as YouTube, iTunes or an RSS feed. With these and many other powerful capabilities, you can be assured your audiences will find the content that interests them the most. Delivering videos is the most critical part of the video workflow. You may have hundreds or thousands of videos, but if your viewers have trouble accessing or playing them, that content is worthless. If you are considering doing the delivery yourself, you must be prepared to handle bandwidth issues during periods of high traffic, device compatibility problems due to incorrect transcoding, and global delivery issues caused by not having delivery capacity in all required regions. If you are not prepared for these challenges, the risks are high your viewers will be frustrated by poor viewing experiences that could cause them to abandon your video completely. LVP is the only major Online Video Platform (OVP) that is fully integrated with a Content Delivery Network (CDN), letting you easily manage and distribute video content without the need for custom coding or integration to a separate CDN for distribution. Using Limelight Networks’ CDN services, companies can deliver broadcast quality live and on-demand video using a variety of delivery methods and protocols to global audiences on virtually any device. ISPs and last-mile networks that bypasses internet congestion. With over 35Tbps egress capacity and more the 80 Points of Presence (PoPs) in over 40 metropolitan locations, Limelight’s network has the speed, capacity, and availability to deliver the highest quality viewing experience to audiences everywhere. The ability to play a video within a website or in a mobile app is an absolute necessity for any company that uses video as part of its business. Another important requirement is the ability to customize the video player to match the company’s brand. And most important, the video player should provide a universal playback experience on PCs, mobile devices and televisions. As mentioned earlier in this document, Adobe is retiring the Flash video format and the Flash Player in December 2020. Companies with Flash video libraries should already be transitioning their Flash video content to the more widely supported HLS and MPEG-DASH streaming formats and an HTML video player. This is a very important consideration for organizations that plan to make their videos publicly available. LVP allows you to customize the supplied video player using the HTML Player Builder and offers the flexibility to use third-party video players such as JWPlayer, FlowPlayer and others. LVP will generate an embed code that can be placed on a webpage that will automatically launch the video player when the page is loaded. The embed code contains all the necessary logic to deliver the right video and settings to that page. And if you require even more player customization, Limelight offers player APIs and SDKs, giving you unlimited options to control the player behavior, while allowing the creation of unique, fully integrated viewing experiences. Your videos are on your website, but how do you know which ones are being viewed, where they are being viewed, or if viewers are watching the entire video? Understanding the viewers’ likes or dislikes allows you to create content that keeps your viewers engaged. Companies that analyze their customers’ viewing behavior know which content is most popular and which is least popular. Using this data, companies are able to gauge their audiences’ interests and produce content that will keep viewers coming back for more. LVP includes comprehensive analytics that give you a complete view into what your viewers are viewing. The data will show which videos are viewed most, the device types they are being viewed on, if the viewer watched the entire video or where they dropped off, and more. Knowing this information will make it much easier for you to provide them with the content they enjoy viewing most. The following figure shows examples of the types of metrics available in LVP. These metrics will provide you with invaluable data for the next stage of the video workflow – Monetization. If your current workflow does not provide you with data about the people viewing your videos, how do you know which videos are engaging them? Monetization will require a better understanding of the people viewing your content so you can present them with content that interests them. Companies that understand their customers’ interests can build a successful monetization strategy. This may include inserting advertising into content as well as the ability to protect it from being viewed by unauthorized users, domains and geographies. LVP provides a number of mechanisms for companies to serve up ads, including integrations with professional third-party ad networks. This allows you to deliver pre-roll, mid-roll, post-roll and display ads in your videos. LVP also allows you to create viewing restriction rules to control the viewing of your content by domain and geography. Limelight Video Platform provides a complete end-to-end video management and publishing solution that is the fastest, most intuitive way to manage and distribute videos to media devices everywhere. Companies all over the world are using it to simplify and automate their video management and distribution processes across a range of workflows.